Beyond an abundant selection of craft beers or expertly stirred cocktails, many San Diego bars have found creative ways to amp up the fun. From coloring book menus and retro arcade games to learning the mysteries of the universe and betting on the ponies, the following are just a few of the spots bringing big fun and games to San Diego’s buzzing nightlife scene. Punch Bowl Social San Diego’s scratch-food and craft beverages are complemented by a generous selection of social gaming. including: bowling, ping pong, billiards, arcade games, giant wall scrabble, shuffle board, virtual reality lounging, private karaoke rooms, and dart boards. Known for its draft cocktails, punch bowls and bartenders sporting suspenders, Polite Provisions, located in the hipster-friendly North Park neighborhood, features a one-of-a-kind menu: a 25-page coloring book. The menu illustrates more than 80 beverages and includes a crossword puzzle, labyrinth maze, word games and 14 classic cocktail names hidden within a word search. At the end of a colorful night, patrons can take the menu home for $8; a portion of the proceeds benefit The New Children’s Museum. Coin Haus in La Mesa Village offers more than 30 video games and an unique self-serve system of 50 taps pouring beer, wine, kombucha and coffee. 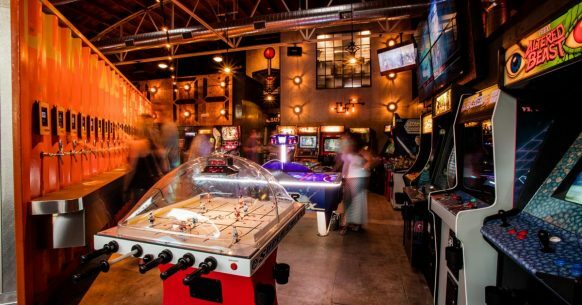 With locations in North Park and downtown San Diego, Coin-Op offers a wide selection of old and new arcade games, a full bar serving craft cocktails and local beers, and a food menu featuring hot dogs, hamburgers and pizzas, varied by location. Visitors might have a hard time defining Moniker General Store. Is it a fashion boutique, an art gallery, or a crafty beverage bar? The 4,200 square foot space in Liberty Station, San Diego’s newest art and culinary hub, is all three and more. The hot spot includes a 1950s inspired cocktail bar named “The Bar” that serves up signature cocktails, mocktails, rosé slushies, and more than 20 bottled beers and 24 wines from San Diego and Baja. Visitors can sip while they shop for new sunglasses or a fixed-gear bike or relax on its pet and family-friendly outdoor patio. Located in vibrant downtown San Diego, Striders offers patrons the opportunity to place bets on horse races happening around the world. Inexperienced race gamblers can even try a complimentary Group Betting 101 class on Wednesdays and Thursdays from 1:00 to 4:00 PM. The two-story, upscale restaurant, bar and lounge features two outdoor areas, a large dining room and an open kitchen. The Turf Club on the second floor features more than 150 HD TVs, a 15-ft TV wall and a giant Jenga and foosball table. Guests can live out their Lost in Translation fantasies at HIVE, a dining, drinking and entertainment venue in the diverse Kearny Mesa neighborhood. A 50-seat bar dubbed “The Island” offers infused spirits, craft cocktails and 50 beers on tap, while a spacious dining area offers an assorted food menu ranging from Asian to Californian cuisine. The main attraction is HIVE’s 13 recently redesigned private karaoke rooms available for rental with option of bottle service. While Donut Bar is technically a donut shop and not a bar, it still offers a sweet way to enjoy a pint of craft beer. The famed spot in downtown San Diego not only sells the world’s most Instagramable donuts but also reopens on Fridays and Saturdays at 5:00 p.m. with freshly baked batches and 24 beers on tap, all carefully selected to pair well with their rotating donut selection. Science and beer collide at the monthly Two Scientists Walk Into a Bar. The Fleet Science Center invites 50 local scientists from fields like evolutionary biology and quantum physics to hang out at 25 participating bars around San Diego and answer questions about any topic. People thirsty for knowledge (and beer) can look for the “We are scientists. Ask us anything” signs at participating bars and breweries. Photo Courtesy of Jeffery Lamont Brown. This entry was posted in Bars and tagged county, culinary by Edna Gutierrez. Bookmark the permalink.